Why bother with aquaponics.... if you want to do hydroponics?? Hay Rupe, I think he is actually doing some comparison testing (not actually in aquaponics.) At least I hope so as I wouldn't want to be adding those things in with fish either. I've been testing out 3 type of different nutriment (certified organic ) they are not cheap but are very concentrate and needs less. also I have a wormculture and make my brewing from the compost monthly, adding woodhash to the mix to benefit of potassium in an organic form. I can tell you that Canna Flores is definitely not organic. Biobizz would appear to be certified organic, according to their website. As far as the BAC nutrients are concerned, the only reference to them being organic is made by the manufacturer themselves. I couldn't find any organic certification on their website for the two products you mentioned, or any of their products. Maybe I missed it, but I would've thought they'd make any reference to organic certification stand out like dogs balls... with great big flashing arrows pointing at it! However, it's not whether a nutrient is organically or synthetically derived that's the issue for use with fish... it's the contents, especially Copper, Zinc etc, contained within the nutrient solution that is an issue. Whatever the source of the nutrients in the bottle, these elements would still need to be in similar concentrations within the solution... so the organic alternative is no less harmful to fish. The occasional dash of Seasol (or Maxicrop) and pinch of Iron chelates seems from my experience to keep the plants happy. Some people growing fruiting plants also find they need to add Pottasium, either through the addition of banana skins and worms to the GB's, or by adding Potassium in one form or another, they've been covered on here extensively. I think if you need to add any more than the items listed above, you may not have enough fish in your system, or the food you are feeding them may not be balanced. 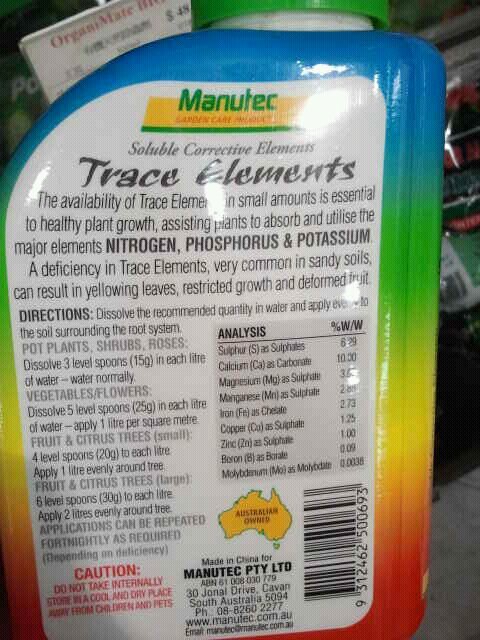 happily enough seasol or maxicrop provides potassium along with appropriate amounts of most trace elements. I have 20 jade perch in my 1000L FT. In my grow beds I've a range of plants but nothing is doing very well. I want to add chelated iron but have been unable to find it here in hong kong. I did find the product below. Any thoughts on the suitability and dosage? Seems like a lot of Cu and Zn for a fish system. I'm sure there is Fe Chelate somewhere in Hong Kong, if not could be shipped? If you can't find something that would be safe enough to dump in the system. You may be able to dilute it and spray it on the plant leaves to give your plants what they need without much risk to the fish if you avoid dumping large amounts of it in the system. So paedur5, if that is the only nutrient you can find, perhaps mix it as a foliar spray and spray your plants with it instead of risking your fish. Foliar feeding is often a good way to get trace nutrients to the plants especially if your system water pH is too high for the nutrients to stay available to the plants in the water. Just make sure to foliar feed early to avoid burning the plants. I use 'trace elements' from bunnings - same bottle as above. I put in about half a cup (then topped up with water) to mix it then dump into my sump. I'm pretty sure I've asked this question before but how are you measuring the K.
It has worked great for me for the most part. I calibrate before every use, which is anywhere between 5-10 tests. I also use the same pens but for calcium (Ca2+) and nitrate.